My Singer Quantum Futura in action. I've been having so much fun working on sewing and embroidery projects with my Singer Quantum Futura machine! The Singer Quantum Futura allows you to combine the power of your own personal computer with the creativity of a fantastic embroidery and sewing machine. 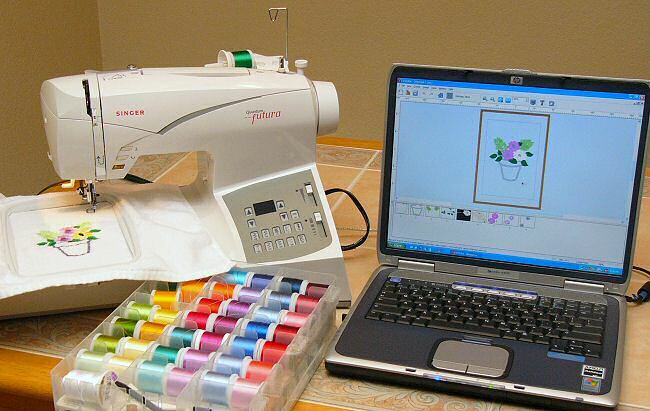 Embroidery projects that would have taken hours by hand can be completed in minutes with this machine. What's so special about the Singer Quantum Futura? There are a lot of embroidery machines out there, but most of them are quite limited in their abilities because of a lack of computing power. Rather than using the small built-in microprocessor of most embroidery machines, the Singer Quantum Futura leaves the computing to your much more powerful personal computer. Just hook up the included USB cable between your PC and the embroidery machine, install the included software, and you've got a more powerful tool than I ever could have imagined back in the days when I was first learning to sew and embroider! If you've been surfing the web for information about the Singer Quantum Futura, you've probably noticed the same old pictures and the same old product information on most of the web sites. It's as if nobody was willing to do any more work than to copy and paste the basic product information from the Singer web site! What I wanted to find out when I went online looking for information about the Singer Quantum Futura machines was: are people happy with them? Would Singer embroidery machine owners recommend the machine to a friend? Have they found that the machine allows them to do what they imagined it would do? Is it worth all that money? Now that I own one, those are the kinds of things I want to share with you here on my web page. Here's a quilt that I recently made for one of my nephews. Each of those white diagonal panels features a different embroidery design. I found the individual designs on the Internet, downloaded them for free, and then had my embroidery machine stitch each item on to a white square. While the machine did all the stitching, I kept an eye on things and waited until it was time to change the thread to a new color. This particular project featured 40 individual embroidery panels. With that many individual items to embroider, you'd never even attempt a project like this by hand. But with a powerful tool like the Singer Quantum Futura machine, it's within reach of even someone with only average skills like mine! Another great thing about the Singer Quantum Futura for a project like this is that it's an embroidery machine and sewing machine all in one. Some embroidery machines only do embroidery, but the Singer is a full featured sewing machine, too. Sewing together all of those individual panels or attaching the border is no problem at all for the Quantum Futura. And it saves a lot of workspace when one machine can do the work of two. 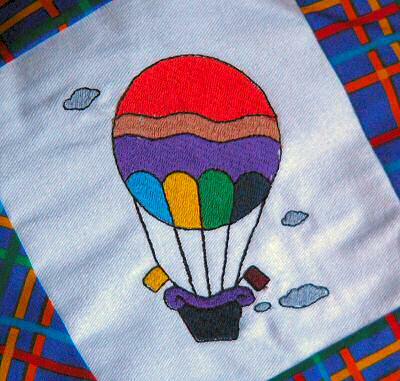 This is a close-up look at some of the embroidery involved in that quilt for my nephew. 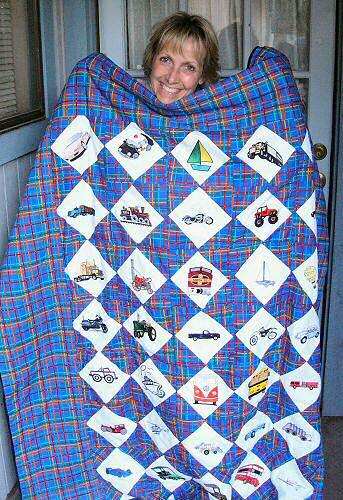 Want to know how this whole quilt idea got started? I had downloaded a bunch of free embroidery designs off of the Internet, and I was just experimenting with my machine to see how they looked all stitched out. I put in a piece of scrap fabric in to the hoop, and let the machine do its magic. After I had stitched out a couple of different designs, I started to think about how cool they would look on a quilt. And that's when I got the idea to turn all those free downloaded designs in to something to brighten up my sister's kid's room! The whole project turned out really well, and now my sister probably thinks I'm some kind of creative genius! This would probably be a good time for me to mention that the Singer Quantum Futura is not the first embroidery machine I've owned. When I first decided to make the leap in to machine embroidery, I looked at all of the embroidery machines I could find and decided to save money by buying one of the least expensive embroidery machines on the market. In retrospect, that turned out to be a bit of a mistake! Once I got used to using it, and had fun doing some basic projects, I quickly outgrew the capabilities of the machine. I wanted to make custom embroidery designs using pictures from my digital camera, or from logos and graphics I found on the Internet. To do this, I ended up spending a whole bunch of money for additional software and add-on equipment. It would have been cheaper and a lot more convenient if I had just bought the Singer Quantum Futura in the first place! And let me share one other thing I've realized about the hobby of sewing and embroidery. The cost of the machines really freaked me out at first, because I'm a pretty frugal person. But the more I thought about it, the more I realized that there's nothing wrong with having an expensive hobby if it makes me happy and allows me to be creative. My husband has been spending thousands of dollars on computers and digital cameras for years... it's time I got to spend some money on something fun for me! There actually was one key feature that really sold me on the Singer Quantum Futura and that was the AutoPunch software that comes with it. AutoPunch is software that digitizes pictures, logos, and graphics in to an embroidery design that your machine can understand. Want to make a t-shirt for your company picnic? Just bring up an image of your company logo in to AutoPunch, and then send the design to your Singer embroidery machine. This is the kind of stuff that only professional embroidery equipment costing thousands and thousands of dollars could have done just a few years ago. With relatively little messing around, I was able to take the NBC peacock logo, and convert it in to an embroidery design using AutoPunch... change the NBC to the call letters of the TV station where my son works... and then have my CE200 stitch it out for me. I made this one as a patch, but it could have just as easily been embroidered right on to a shirt. Fun! Think of all the cool things you could make with this! And it's not limited to logos. Take a picture with your digital camera, or download a picture off the Internet... fiddle around with it in AutoPunch until you've got it just right... and then stitch it out on to a t-shirt, a hand towel, make a patch out of it, or whatever you want. The possibilities are limited only be your creativity. 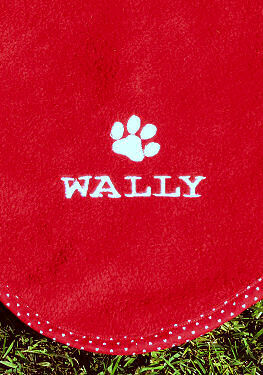 Another fun item that I've been making on my Singer embroidery machine is personalized dog blankets. I downloaded a paw design for free off the Internet, and then just add in the name of the dog. 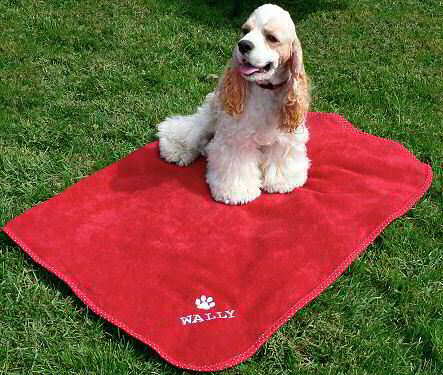 It takes the Singer Quantum Futura about 15 or 20 minutes to stitch out the paw and the name... I don't even have to be in the room! The hardest part of making these personalized dog blankets is not the embroidery at all... it's creating and attaching the border around the edge of the blanket. As you can see, I've REALLY been enjoying my Singer embroidery machine. If you've decided that this is the machine for you, too... let me give you a little advice on the best way to get one. You've probably noticed that they're very hard to come by, and that they aren't on sale in most local retail and discount stores where sewing and embroidery machines are sold. The Singer Quantum Futura is available at several online retailers, but with a little web surfing you'll quickly discover that the price is basically the same everywhere it's sold. I don't know why this is, but I suspect Singer has some kind of control over the pricing. So if you're going to pay the same price no matter where you buy it, why not buy it from a reputable retailer that you know you can trust? I've had so many good experiences with Amazon.com that I figure why shop anywhere else if the price is going to be the same? If you click here, you can order your Singer Quantum Futura from Amazon.com, and they'll share a small referral fee with me... and that's the nicest way you can thank me for taking the time to share my experiences with you via this web page. Need a good source for embroidery supplies? and they will reward me with a small commission on your purchase. to share the Singer Quantum Futura information with you. 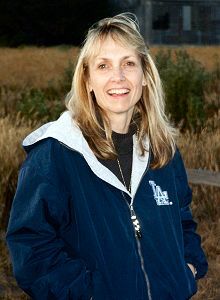 If you have comments or questions about this web page, send an email to me, Kellyn Zimmerlin. Copyright ©2009 Kellyn Zimmerlin, Grover Beach, California. All rights reserved.